CHA starts tomorrow….and since I’ll be at the Daniel Smith booth, I figured I’d show you some of the samples I took with me! 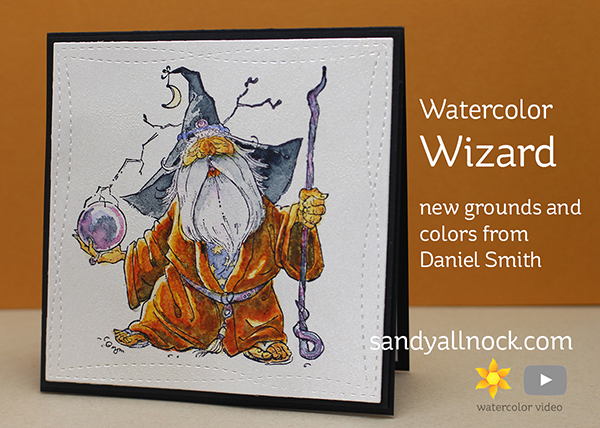 Daniel Smith makes grounds – basically gessos that turn almost any surface into a watercolor surface! In the video below I show you how I added texture to mine since I like cold press and especially rough cold press papers…you can give it less texture too, customizing it any way you want. Watch the video below or click HERE to see it in HD on YouTube. Doesn’t it look beautiful on the gold too? 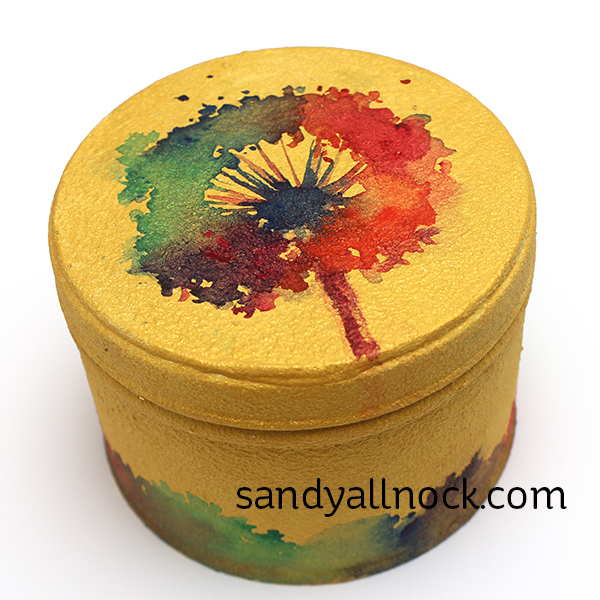 I covered a chipboard box – it had a pattern on it so I covered it in inexpensive gesso first, til I had a basic white surface to add the pearlized ground to. Then painted poppies! I wanted to see how this worked on tin – it was great! 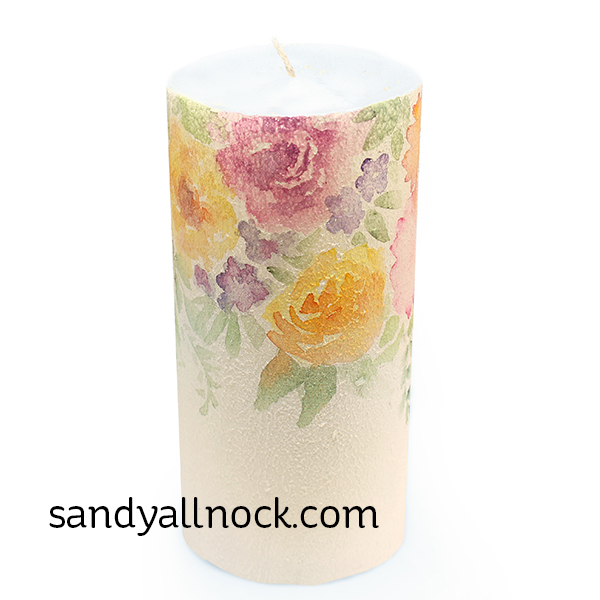 And this candle came out beautifully. Be careful with this, because the grounds could possibly exude a smell you might not like…I’ll try burning it sometime and see what happens. 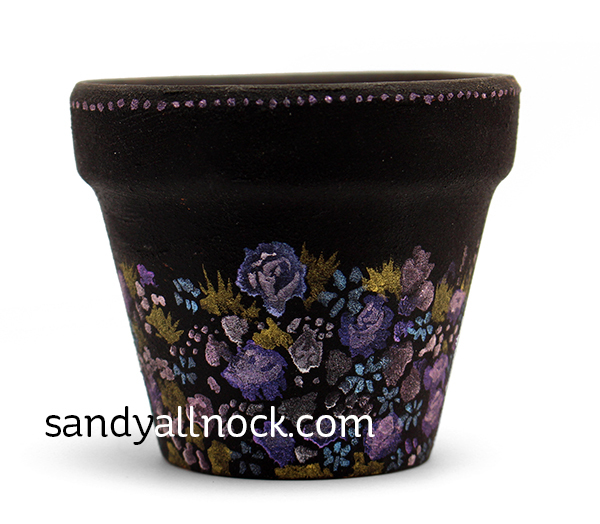 Didn’t want to try that before the show 🙂 And I also had some of the black ground, so used that on a teensy tiny clay pot, using some of the iridescent colors. Since these are new, they aren’t in-store yet…but they’re coming soon! I couldnt get the stamp link to work. Love the grounds idea. It’s apparently unavailable now – I see she’s only got one more stamp design left by Mo Manning so perhaps she’s discontinuing. Awesome as always Ms.A!! Loving the candle idea. WOW, thanks for showing how to use these new grounds! I would not use them on any grounds or gessos. Ever. Iridescent colors on black are gorgeous! A CANDLE? My head is spinning with ideas but did you check to see if there was poison in the colors of paint or ground so fumes were not a problem? You are so adventurous! What a nice surprise on this very dismal day. These grounds are so cool, love the idea of re painting outdoor decor items that have faded. Do you think you could use copics on the grounds? There was a local class called copics on canvas that I couldn’t go to due to work, and I still haven’t found out the secret to using copics on canvas. Any ideas? I adore Mo Manning too! Loved all versions of the wizard. The other things you tried the grounds on are stunning. I’m intrigued by these new products! The Pearlescent ground looks really interesting. Cute wizard stamp and your cards are adorable. Thanks for all the great tips. I LOVE this wizard. Your work is beautiful as ever. 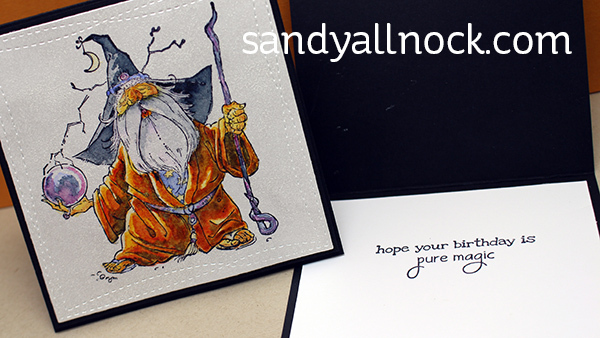 A beautiful job on all of the cards Sandy and your projects are lovely as well! I love the tin! I am guessing you painted it yourself but if it was a stamp I would love to buy it! 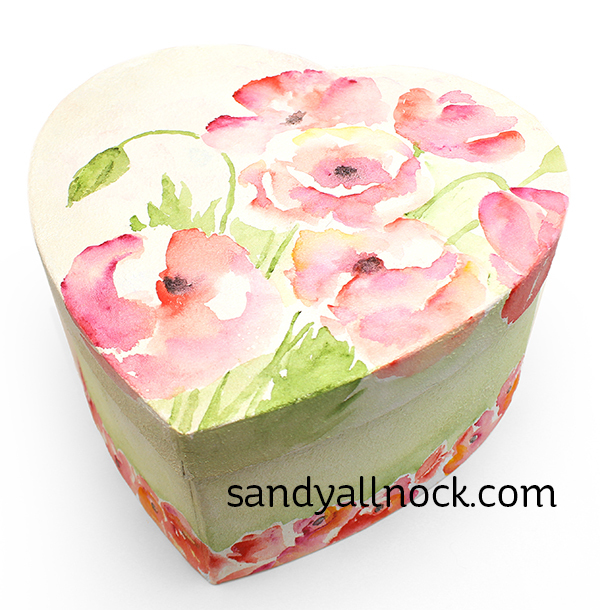 Sandy, all of these projects are wonderful but the painted poppies on the heart box took my breath. You are an amazing artist. Sandy, these are all such beautiful paintings! Have fun at CHA! 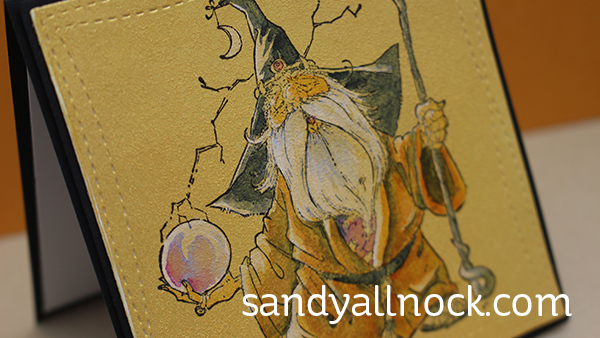 I really like that wizard stamp…they are out of stock, but I’m on the “notify” list. The new Grounds look really interesting – can’t wait till they’re available to try!